For AUTOMATIC BREAD MACHINE, place ingredients in container in following order: water, olive oil, flour, sugar, salt and yeast. Select Dough setting and press Start. For FOOD PROCESSOR, dissolve yeast and sugar in warm water in a measuring cup; let stand until bubbly--about 10 minutes. Stir in olive oil and salt. Insert metal blade or plastic dough blade. Place flour in work bowl. With motor running, pour yeast mixture through the feed tube in a steady stream, as fast as the flour absorbs it. When the dough forms a ball, stop the machine. Process continuously for 45 seconds to knead. 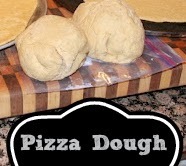 Shape the dough in a ball, and place in greased bowl; turn to grease top. Let rise in a warm place until doubled--about 1 to 1 1/2 hours.